FINAL SALE. Are you looking for something a little softer than your typical tough-girl leather jacket? Consider this beautiful and feminine alternative. The Vegan Leather Open Jacket manages to be both one part edgy and another part sweet and feminine—and it is made entirely of animal friendly faux vegan leather. The Vegan Leather Open Jacket is fully lined in a thin fabric—this is a very light jacket. It has long sleeves and a fitted blazer cut. The best part of this jacket is the open front with a “ruffled” placket that drapes to create a polished, put-together look. A hidden pocket on each side completes this jacket. The Vegan Leather Open Jacket would look great paired over any fitted tank or top in your closet. You could try pairing this with denim or leggings and some cute boots. Toss on a scarf if you need more coverage. This jacket comes in two color options to choose from, creating two distinct looks. Details: Lined. Hidden side pockets. Shell: 50% polyester, 50% PU. Contrast: 90% polyester, 10% spandex. Lining 1: 100% cotton. Lining 2: 100% polyester. Dry clean only. Small measurements: Length from top of shoulder to hemline: 24”. Sleeve length: 24”. 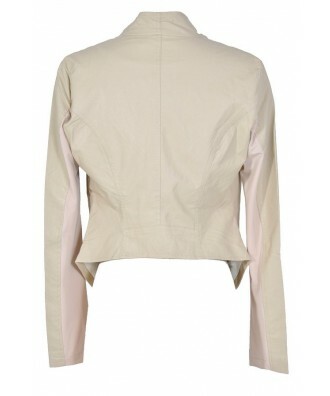 You have added Vegan Leather Open Jacket in Beige into Wishlist. 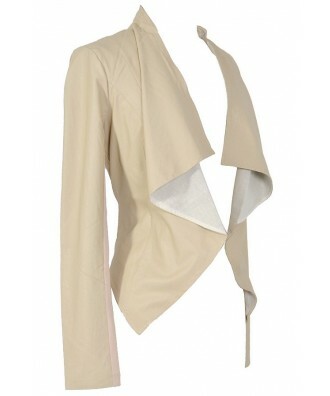 You have added Vegan Leather Open Jacket in Beige for Stock Notification. 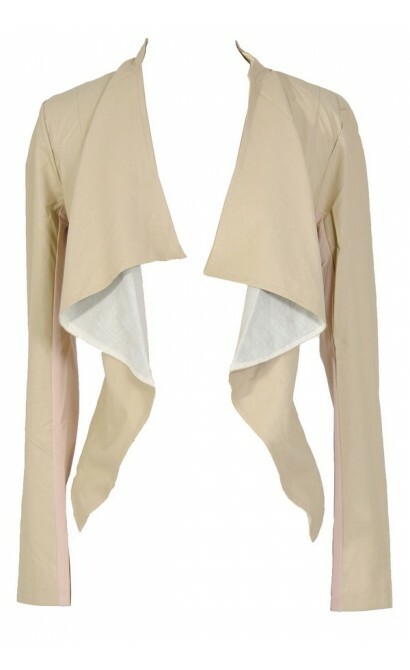 You have set Vegan Leather Open Jacket in Beige as a loved product. You have removed Vegan Leather Open Jacket in Beige as a loved product.